This function has the same arguments as Windows TextOut() function with an additional argument, oblique, to specify the text slant angle. The function can be placed where TextOut() is normally used. Insert the function source code into your source code file. Call the function at places where you would normally call Windows TextOut() function. Remember to select the font, set the text background mode, color and background color etc, as you would normally do before calling TextOut(). 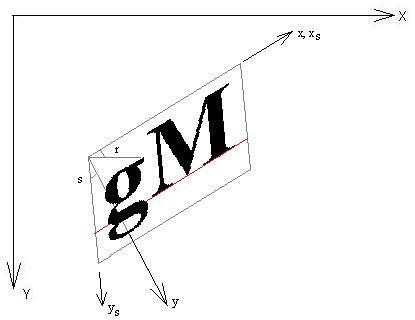 Angle oblique is positive if the text slants forward(to the right) and negative if it slants backwards(to the left). The oblique angle, s, in the figure below is positive. The angle is in 1/10th degrees. Therefore, if the text slants forward 15 degrees, oblique=150. where (x,y) are the World coordinates and (X,Y) are the Paper space coordinates. where s is the slant or oblique angle. The Paper space is noted as X,Y. From the Sheared space to Paper space, the transformation is a rotation(angle r) and translation(Xo,Yo). The call to SetGraphicsMode() is needed. Otherwise, function SetWorldTranform() will have no effect. Since now we are drawing in World space, we need to adjust the font's rotation(lfEscapement) to be horizontal and the character orientation(lfOrintation) to be from the World X-axis.